WE INVITE YOU TO TAKE OUR SELF-GUIDED SCHOLAR’S TOUR of the Forest Hills Cemetery with cultural and design historian Elise Ciregna, PhD. Tour Author Elise Ciregna, Ph.D. In 2005, the Trust received a grant from the Massachusetts Foundation for the Humanities to underwrite a four-month Scholar in Residence program with cultural and design historian Elise Ciregna. Elise focused her work on researching the cultural meaning of selected memorials. 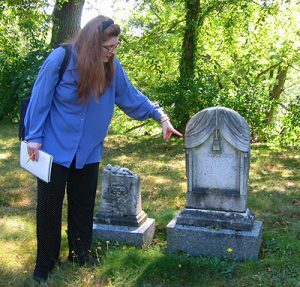 She investigated how the cemetery’s beautifully carved stones express and embody Victorian attitudes about family and social relationships, life and death, sentiment and fashion. 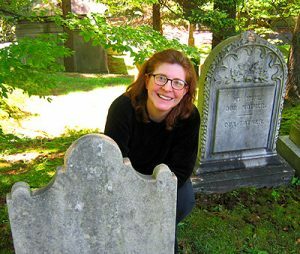 She examined the cemetery as an extension of domestic space, a concept that offered 19th century Bostonians the comfort of a final home where the living could visit the dead. Elise also looked at the ways the layouts and memorial furnishings of family lots echo the architecture and furniture of private homes. She researched several lots, and found that some are arranged in “neighborhoods” of family, friends, and business colleagues. Some of the results of her research are incorporated into this Scholar’s Tour. We invite you to travel with Elise as your guide on a virtual tour of many of the historic treasures to be found at Forest Hills. Welcome to Forest Hills Cemetery, Boston’s beautiful rural cemetery, founded in 1848. Forest Hills is an extraordinary park, landscape, museum, and burial ground all in one. 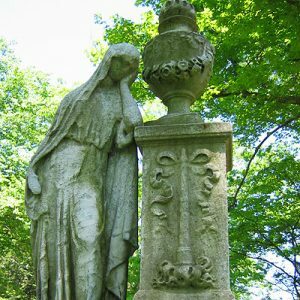 As a “Victorian” cemetery, or one founded during the Victorian era, between about 1830 and 1900, Forest Hills Cemetery is also a fortunate surviving repository of the love for marble monuments. Here, in the picturesque park-like landscape that is the cemetery, you will see mourning parents, successful businessmen, and virtuous wives — all buried here in the steadfast belief they would be reunited in the afterlife. The family cemetery lot was merely the final earthly home for the physical remains of the departed — the heavenly home awaited. 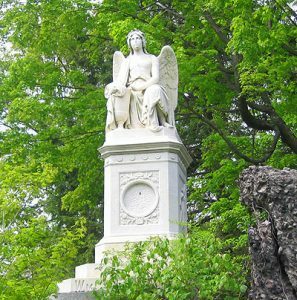 Forest Hills is blessed with one of the country’s most extensive collections of 19th century sepulchral sculpture. 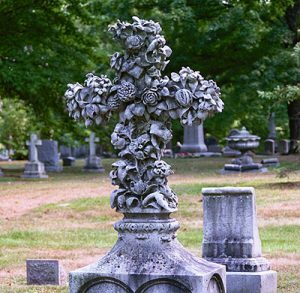 This virtual tour will lead you to some of the Cemetery’s most striking funerary monuments, many for people who are unknown today. As a nineteenth century visitor, you would have known what many of the monuments said about the people buried at Forest Hills. This tour will help you “decode” the Victorian monuments you are about to visit. Along the way you will learn a lot about how Americans in 19th century Boston thought about and experienced life, society and culture. The stories are in the stones. Forest Hills was founded as part of what is known as the “rural cemetery movement.” Starting with Mount Auburn Cemetery (Watertown and Cambridge) in 1831, cemeteries sited in beautiful landscapes outside the city not only solved the public health problem of overcrowded urban burial grounds, but allowed for the flowering of a romantic visualscape of marble gravestones and funerary sculpture that we associate with the Victorian era. Rural cemeteries were designed to be beautiful, natural landscapes incorporating wooded areas, winding paths, valleys and ponds that provided a variety of areas to soften and even enhance the melancholy experience of visiting the cemetery. 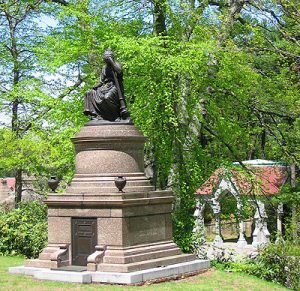 In 1848, Henry A.S. Dearborn, mayor of Roxbury (which would be annexed to Boston in 1868), who had also been one of the founders of Mount Auburn Cemetery and its main landscape designer, saw the need for another great cemetery. 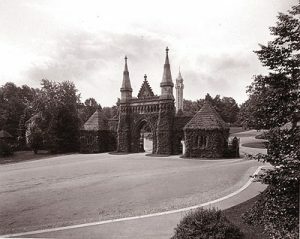 He thus founded Forest Hills, designing this cemetery on a much grander scale than Mount Auburn. Founded as a municipal cemetery, Forest Hills was also inclusive. As a result, a wide swath of Boston 19th century social classes and ethnic groups is represented at Forest Hills, from shoemakers and wealthy industrialists to artists and intellectuals, along with their spouses, children, and sometimes — well, at least in stone — their pets. Your first stop is the General William Sumner Monument. The General William H. Sumner (1780-1861) monument was made in Rome, Italy by sculptor N. Cantala Mesa Papotti. Before the 1830s, sculpture as an art form did not really exist in America, and training was scarce. Starting in the 1830s, though, as American artists became more interested in pursuing sculpture as a profession, they started going to Italy for their training, which had a long and illustrious history dating back to ancient Greece and Rome as the world’s leader in the production of classical sculpture based on ancient Greek and Roman styles, done in the lovely white Italian Carrara marble. Italy was full of marble cutting workshops, producing and copying standard designs such as busts of famous historical figures, or, as we see here, funerary monuments. Papotti’s angel is part of a long artistic tradition. Angels since the Renaissance have represented messengers from God. They were, and still are, a popular cemetery motif. Angels were often used at the graves of children, sometimes shown carrying the child up to Heaven. The thought that one’s loved one was among the angels in Heaven, only awaiting a reunion with family and friends, was a comforting one. General Sumner’s monument was personalized on the base with a representation of a family crest, and on the front, in the medallion, a low-relief portrait of his face (now gone). Notice also how bright the marble looks. The Sumner monument was cleaned in recent years, and so looks close to new. Originally, like most 19th century marble sculpture, the marble would have been polished to a high, glossy shine; white marble was blinding in sunlight, and practically glowed at dusk. Today, most marble monuments at Forest Hills are worn—but imagine all of them as bright white beacons on the landscape, as they looked originally. Perhaps this glowing white marble angel high above the visitors reminded them think of heavenly light? The next stop is the John R. Robbins Monument. This monument, like the Sumner monument, was likely another off-the-shelf piece imported from Italy, although we can’t be certain. Books full of possible monument designs were available to clients, who like today could choose something they liked or felt was appropriate. The motifs Mr. Robbins chose would have been very familiar from the study of classical civilization, literature and mythology, which was an important part of one’s formal education. The figure of the mourning or weeping woman, dressed in Greek-style robes, is an allegorical figure, that is, an embodiment of an abstract concept. Allegorical figures have been classified in books for architects and architects, along with their “attributes,” or symbols, since at least the Renaissance; allegorical figures show up all over the Cemetery. This particular mourning figure is known as “Grief.” Grief always leans next to or near a funerary urn. The funerary urn is another reference to classical Greece, where urns held the ashes of the deceased. Versions of Grief were extremely popular in the American Early Republic period (1780-1830), when they were reproduced as tabletop ceramics, or by young girls in needlework pictures, especially when someone famous died, like George Washington. When Mr. Robbins chose this monument, Grief and her urn was a well-known mourning image in nineteenth century popular culture. Notice also other elements that you will see repeated elsewhere at Forest Hills, including the inverted torch that indicates the “snuffing out” of life, and the flame at the top of the urn, which refers to eternal life or resurrection. The winged hourglass refers to the passage of time. Robbins also wanted to make sure that people knew he and his family were familiar with the Bible; the Biblical inscription “I am the Resurrection and the Life” on the front is the same as that on the Cemetery entrance gates. This monument was considered very fashionable in its early days; an engraving of it was included in the 1858 guidebook of Forest Hills showing notable or beautiful monuments. Take a moment to consider next the Randidge Monument. The Randidge monument of about 1891 was executed by sculptor Adolph Robert Kraus, with the base designed by architect Carl Fehmer. It can be considered the counterpart of the John R. Robbins Monument, built 40 years later and in a different style. Even though the Randidge monument is much larger in scale than the Robbins monument, the elements are essentially the same, and express the same feelings: the figure of Grief in classical robes leans in sorrow on an inverted torch; funerary urns decorate the four corners of the base. The different materials used — bronze, granite — show the changes in the fields of sculpture and monument making that had taken place in the late nineteenth century, when Paris and the Beaux-Arts (“beautiful arts”) school replaced Italy as the center of the Western art world, and when bronze and granite replaced marble as the dominant sculptural materials. The next stop is the Warren Family lot. The Warren family lot is a good example of the dramatic changes in funerary sculpture that took place from the colonial era to the Victorian era. General Joseph Warren was one of the heroes of the Revolutionary War. He was killed at the battle of Bunker Hill (to be more precise, Breed’s Hill) in 1775 and was first buried there. 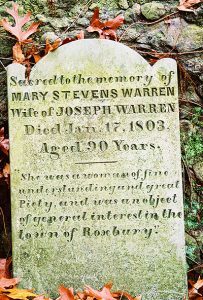 Warren’s remains were moved several times (including to the Granary Street Burying Ground, to a family crypt in St. Paul’s Episcopal Church, and briefly, to the family backyard in Roxbury), until the family purchased this lot at Forest Hills Cemetery in 1852. Remains of other family members were moved here also, along with their original headstones. Before the nineteenth century in New England, graves were usually marked with slate slabs showing what Nathaniel Hawthorne once called the “lugubrious emblems of mortality” — mainly skulls, skeletons, hourglasses and other frightening symbols, known as memento mori, or reminders that death overlooks no one. The portal-shaped stones represented the doorway through which one exchanged their earthly life for the hereafter. Calvinist theology concerning the afterlife seems harsh to us today. Puritans did not believe in excessive funerary ritual. Their belief in the doctrine of predestination meant that the fate of the deceased in the afterlife (Hell or Heaven) was out of their hands, so it seemed pointless to spend time visiting a gravesite, or to provide an inviting, beautiful burial ground. One other feature of this lot is the large mound of Roxbury puddingstone. You will find these rock formations composed of small stones all over the landscape at Forest Hills, since it is one of the unique geological features of this area of Boston, and in particular of the Cemetery. It was called “puddingstone” because it actually looked like nineteenth-century pudding. Every family had their own recipe at the time, but in general Victorian “puddings” were full of plums, figs, raisins and other fruits, and cinnamon, nutmeg and cloves — very sweet, lumpy and dark — hence the name given to this very special, native type of stone. And, one other fact about Roxbury Puddingston — it is the official state rock of Massachusetts! The next stop is just a few steps away — the Hosea Fisk Family Lot. The Hosea Fisk Family Monument is a small headstone second from the left in a series of five headstones, right next to the very small headstone showing a sleeping child. We don’t know anything about Hosea Fisk personally, but his wonderful headstone tells us something about him and his family. Fisk bought the family lot in 1855 when his little daughter Harriet died; he died just three years later in 1858. His wife probably chose the headstone, since you can still faintly read the inscription “To my husband.” The stone that Mrs. Fisk chose is modest, so she might have been trying to convey that her husband was also a modest man. But most of all, it seems that Mrs. Fisk wanted to emphasize that domesticity and respectability were important qualities she and her husband shared. Displaying textiles and upholstery, even on a gravestone, was one of the most common ways to do this. In the mid-nineteenth century, improvements in manufacturing made textiles and upholstery increasingly available to the large middle classes. In a time of rapid urbanization and industrialization, the home was considered a refuge and a haven from the outside world; women in particular were considered the stabilizing force inside the home. Women were also responsible for the decoration of their homes. The ideal middle-class family was best represented by a well appointed home in which one’s family lived a comfortable, happy life. Respectable homes often had two “parlors”: the “best” parlor was the most elaborately decorated room in the Victorian home, for it was where the family would receive guests, and show off their best furnishings. Having lots of tufted chairs, elaborate drapes at the windows, fringe, trim and tassels was an effective way to let visitors know that one’s family was fashionable, tasteful, educated, and part of polite society. Often, a second parlor, less fancy but still containing lots of comfortable chairs and drapes, was the center of family life in the Victorian home (what today we call the “living room”). It was the room where the family gathered after dinner to read, sing along to music on the piano or organ, play games or do needlework, and where the fire or woodstove kept everyone warm during cold winter nights. So is this a parlor window? You be the judge. You might want to consider Hosea Fisk’s headstone as a kind of parlor window and curtain that lets you “look” into Mrs. Fisk’s home as she wanted you to see it: as a place that had both a proper middle-class parlor and a more informal, comfortable, cozy family setting. Another possible interpretation is to think of the curtain as a kind of theatre curtain, with the implication that the curtain is going down on Hosea’s life, or perhaps going up on his new life in Heaven. The next stop is a pair of lots — the Nathaniel Tucker and Ariel Low lots — directly across from each other. These two lots are considered together because they are related. Ariel Low bought his lot in late October of 1854; Nathaniel Tucker bought his lot across the way (actually a double lot) just 2 1/2 months later, in early January 1855. Both Ariel Low and Nathaniel Tucker were dealers in leather goods. In their early days their businesses were on the same street in Boston, just doors away from each other. They even died just 6 months apart. Cemetery records indicate that Low bought his lot with business associates and friends; this probably happened with Tucker as well. Since Low and Tucker were both in the leather business, it is very likely they were close friends or business associates. At the top of the Tucker monument is another allegorical figure, this time Hope. The figure of Hope is always shown with her attribute, an anchor, as here. The bottom part of the monument shows a more personal scene: a couple in nineteenth century clothes cross their hearts as they face each other, as winged cherubs hover over them in the clouds. Put together with the choice of Hope as the main figure, the scene most likely refers to the expectation that the couple and their family members and friends would be reunited in the afterlife. (Note: there are no 19th century children buried in the lot, so we don’t think the cherubs refer to Tucker children.) Death would bring a joyful reunion in Heaven. Notice also the motif you have already seen, the inverted torches. The Ariel Low lot across the way is shared with members of several other families, which contains another type of monument. The sarcophagus refers to a casket. It is covered with an elaborate and beautifully carved sheaf of wheat. The sheaf of wheat refers to the fact that Low had a prosperous, successful and long life, and that his “harvest” was now in. Low made sure people knew he was a good Christian, as represented by the cross. The ivy refers to things like friendship, fidelity, and everlasting life. Taken together with the granite curbing at each of these lots, reminiscent of city lots, the Low and Tucker lots create a kind of neighborhood. Clearly, Ariel Low and Nathaniel Tucker, along with their friends and family members, replicated and even perpetuated here in the cemetery their earthly bonds of friendship and kinship which would continue in the hereafter. Very likely also in the nineteenth century the lots were furnished with iron garden furniture and urns with plantings. (This is no longer allowed.) It was not uncommon to think of the family lot as an extension of the family’s home, a place to pay a “visit” to departed loved ones, and to spend a little time at the lot. A visit to the family lot could be an enjoyable, relaxing one, especially in a beautiful park-like cemetery like Forest Hills—exactly as it was meant to be used. Proceed to the next stop, the Stillman E. Chubbuck family lot. The lot of S.E. 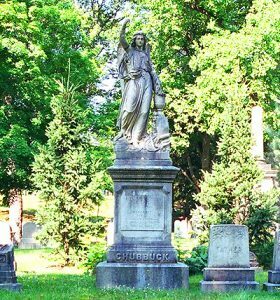 Chubbuck has at its center a large monument of an angel. Stillman E. Chubbuck was a leading machinist in nineteenth century Boston; his full-page advertisements in Boston city directories showed an image of his impressive manufactory, and explained his company could outfit tanneries, breweries, hotels and factories as well as homes with his steam engines and boilers. Chubbuck was also called on to testify as an expert at an industrial accident trial in 1846 concerning a steam boiler that had blown up and killed two people (at another plant). The beautiful Campbell brownstone monument at the Campbell lot has a funerary urn on top with a graceful carving of the eternal flame. A relief of two hands clasped is a sign of eternal love or friendship, enclosed in a wreath of oak leaves and acorns. Oak leaves often represent fidelity and eternal steadfastness, perhaps here indicating the strength and endurance of the Campbell marriage, a relationship that will survive death. Sometimes clasped hands are also interpreted as saying “goodbye, until we will meet again,” suggesting reunion in the afterlife. Proceed next to the Simon Willard monument. Simon Willard (1753-1848) is considered one of the finest clock makers and inventors in American history. His tall clocks were made by hand and placed in “Roxbury cases.” His more compact timepieces, commonly known as “banjo clocks,” were prized possessions when new. Today, Simon Willard clocks and timepieces, examples of the leading precision technology of its time, are coveted by museums and collectors alike. Simon Willard was raised on a farm in Grafton where he and three of his brothers, Benjamin, Aaron and Ephraim became clock makers. Simon was apprenticed at the age of thirteen to clockmaker Mr. Morris in Grafton. During the Revolution, he served in the Grafton Militia Company under Captain Aaron Kimball and was a “Minuteman” who responded to the Lexington alarm. In 1775, he married Hannah Willard, his first cousin, who died in childbirth the next year. His second wife was Mary Bird Leeds (1763-1823), with whom he had eleven children. Willard and his brother Aaron Willard moved to Roxbury in 1780 to a small wood framed house at 2196 Roxbury (now Washington) Street, a prime location for his business. As a clockmaker and an ingenious inventor, he patented a clock jack in 1784 that was used for roasting meat by rotation. In 1802 his “Willard Timepiece” was patented, and in 1819 his patent for an alarm clock was recorded; he also invented the machinery for the revolving lights of lighthouses. Willard was also related to other interesting Bostonians. At the front center of the base of the Willard monument is the signature of Alpheus Cary, Boston’s leading monument maker at the time, who made this beautiful monument in the Gothic Revival style. Willard’s son-in-law Isaac Cary, a well-known and respected bank note engraver, was Alpheus’ brother. The Cary brothers’ father (Alpheus Sr.) had also fought in the Revolutionary War, so the Willard and Cary families might have had a long acquaintance dating from the late eighteenth century. After a brief career as a schoolteacher, Alpheus Cary turned to stonecutting and had a long and prolific career as a monument maker. He seems to have been sort of a “stonecutter to the stars,” since he designed and executed the monuments for many prominent Bostonians, and exported his work as well. Cary stones are often signed, which helps to identify it. To date, over 300 Cary-signed monuments have been identified all over the United States, as well as a number in Nova Scotia. Forest Hills Cemetery has a number of examples of his work (keep an eye out for his signature, usually on the front of a stone). Cary was also involved in Boston civic and political life; he held office as a ward official and was one of the leading members of the Massachusetts Charitable Mechanics Association, an organization that promoted the highest standards of quality and workmanship in the trades. In later life, Cary also published a book of epitaphs, a compilation of his favorite sayings. These ranged from ancient Greece to Shakespeare to contemporary poets—proving that nineteenth century monument makers were often more than “just” stonecutters. These men were generally well educated, literate, and highly respected professionals whose business just happened to be creating elegant and fashionable monuments. Often, like Cary, they also provided things like mantelpieces and architectural elements for home decoration. As you leave the Simon Willard lot, you might consider how the Willard and Chubbuck lots seem to have a kind of dialogue with each other. Simon Willard’s genius as an inventor and clockmaker made the work of later specialists and machinists like Chubbuck possible. Perhaps the proximity of Simon Willard factored into Stillman Chubbuck’s decision when he purchased his lot? Willard’s brothers were also clockmakers; if you would like to learn more about the Willard family and their clocks, visit the Willard House & Clock Museum in Grafton, MA. The next stop takes you to The Civil War Soldier’s Cap. This Civil War soldier’s monument is distinguishable because of the soldier’s cap lying on the top of the tree stump. 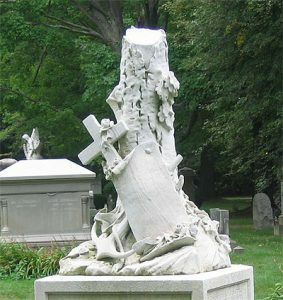 The tree stump is another common motif you will see at Forest Hills Cemetery — like a broken column, it refers to a life cut short or cut down. The next stop is the Benjamin Hemmenway Monument. The Benjamin Hemmenway Monument is a tall columnar monument showing a lyre on the front, encircled by a wreath of laurel. Notice the broken string in the lyre — a clue that a life has ended, and another popular Victorian cemetery motif. Mr. Hemmenway was a coppersmith in Boston. Within the Lovering family lot are a row of headstones. The first monument on the left is that for little Hannah Lovering. Hannah died in 1850 at the age of two years and 3 months. She was the first burial in the family lot. We don’t know why Hannah died, but child mortality was extremely high in the 19th century. More than one-third of all deaths every year in nineteenth century Boston were children 5 years or younger. Today such a figure seems staggering. In a time before advances in medical research, though, contagious diseases such as diphtheria spread quickly, killing the most vulnerable beings, usually children. Most children grew up having lost at least one brother or sister, or a childhood friend. The death of a child was always, of course, tragic. The terrible reality of losing a child, however, could be softened by taking comfort in the thought that a child had simply fallen asleep, or was with the angels, waiting for the inevitable reunion in Heaven. 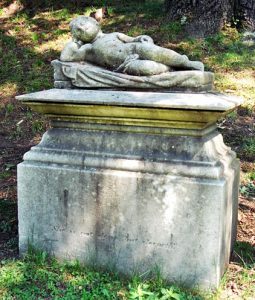 For her gravesite, Hannah’s parents chose an Italian sculpture showing a sweet and chubby little baby fast asleep. If you look on the front of Hannah’s monument, you will see what Hannah’s parents wanted you to know about their baby: “She is not dead, but sleepeth.” The sculpture was considered very fine in its early days; it was protected by a fancy glass conservatory box, which is now long gone. Before you take leave of Hannah Lovering, notice another child on the other end of the row of headstones. 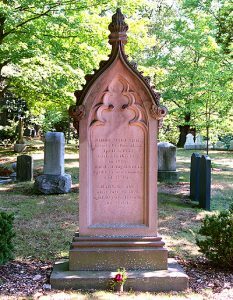 “Cheney’s” stone shows a lily-of-the-valley (symbol of purity or sweetness), a common motif especially for children and women. And in the family lot next to Hannah’s, a little lamb, a very popular theme for children’s graves — referring to innocence, purity, and to a “lamb of God” — sits on top of yet another child’s stone. Proceed to the next stop, the Barnard Dog. There are only two people buried here: Henry Barnard and his wife Lucretia. Mr. Barnard was a shoemaker who died in 1853; Mrs. Barnard lived for another 60 years, until 1913. It was Mrs. Barnard who chose this wonderful dog sculpture to mark her husband’s grave. We don’t know much about the Barnards, but we do know quite a bit about the sculptor Henry Dexter, who made the dog. Henry Dexter grew up in rural New York and Connecticut and apprenticed as a blacksmith. His family was relatively poor, and blacksmithing was a respectable way to make a good living, since farms and other businesses always needed the services of someone who could make and repair tools. Dexter was apparently successful as a blacksmith. His secret dream was to be an artist, though, and after years of waiting, with his family’s blessing, he moved to Boston to study painting with his wife’s uncle, portrait painter Francis Alexander. Dexter’s artistic career really took off when by chance he tried molding some leftover clay and found he was a better sculptor than painter. Perhaps working in a three-dimensional format, as he had in blacksmithing, came easier to Dexter than painting on a flat surface. Whatever the reason, because there were so few professional sculptors working in Boston at the time — most of them had gone to Italy for their training and professional careers, something Dexter was not interested in doing — Dexter soon became one of the best-known sculptors around. 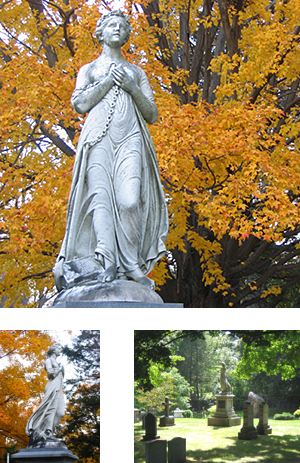 He and Alpheus Cary (the maker of the Simon Willard monument at Forest Hills) collaborated on the first famous American-made cemetery figure sculpture, the Binney Memorial of 1840 at Mount Auburn, a statue of a sleeping child that no longer exists. The success of that sculpture helped Dexter become famous. Soon he was receiving all kinds of commissions, including one from the famed British writer Charles Dickens, who sat for his portrait bust in Boston during his visit to America in 1842. 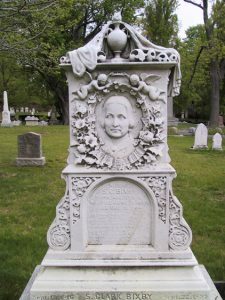 By the time Mrs. Barnard needed to purchase a monument for her husband’s grave, Henry Dexter was a well-known Boston sculptor. There is no record in Dexter’s papers of a commission from Mrs. Barnard, so it is likely that she purchased something “off-the-shelf” which pleased her. 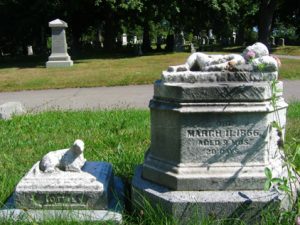 Dogs were popular subjects for garden statuary, as well as for grave monuments; there are a number of other stone dogs at Forest Hills. The Barnard dog represents one of the most popular Victorian dog breeds, the Newfoundland, a large-size dog that was extremely gentle and good with children. In the 19th century, pets were increasingly becoming part of the family. Along with St. Bernard dogs—with which Newfoundlands were often bred—these two large dog breeds dominated children’s tales of dog rescues. Dogs were often depicted in cozy scenes of daily family life. Fun fact: the family dog in Peter Pan, “Nana,” was a Newfoundland. Proceed to the next stop, the Lucy Bixby Monument. This beautiful and very fancy stone memorializes Lucy Bixby, a 45-year-old woman who died in 1864. The headstone required extremely skilled carving and therefore would have been quite expensive. It was probably made in the Boston area, since Mrs. Bixby’s husband likely chose the different elements, and might even have provided a photograph or image of his wife so that her portrait could be carved in marble. Portraits in marble, especially of persons who were not famous or celebrated in any way, are relatively unusual, which is one of the reasons this headstone is quite special. Lucy Bixby is memorialized here as a woman who was virtuous and pious. She is shown receiving a crown, a sign of resurrection, the highest award possible for a departed soul. Crowns as symbols of resurrection, like other motifs you have seen today (such as angels and allegorical figures), have a long history in Christian and European traditions. Ivy (symbol of fidelity and marriage), roses (love), and lilies (resurrection and purity) surround the face. In the 19th century, middle-class women in particular were expected to adhere to the highest moral standards of society; their deaths often left fathers, husbands, and children without the one person who was most central to their lives. We don’t know the exact circumstances of Lucy Bixby’s death or what she died of, but looking at her headstone we can be sure that her husband and her family were devastated at losing her, and wanted to make sure she would be remembered as they knew her — as a good Christian wife and mother. Proceed to the next stop, where you will see a Lamb and Sleeping Child. This images shows two monuments to children who died within the same family. Another example of a sleeping baby similar to the Hannah Lovering monument seen earlier, this baby also “sleeps” on a pillow and bed. Next to the sleeping baby is another child’s monument, this one of a lamb. Lambs, of course, are babies, so they seemed particularly appropriate for children’s graves; they were extremely popular as grave markers. A lamb could be read as either a Christian reference to the child as a “Lamb of God,” part of the “Shepherd’s (God’s) flock,” or as a secular emblem of a young, innocent child. The next stop is the Mary Wentworth monument. This is the brownstone memorial to Mary Wentworth, who died in 1849, similar to the Simon Willard stone. It was made around the same time that Alpheus Cary carved the Willard stone — but someone else made this one. This is probably a case in which two different monument makers interpreted the same design in slightly different ways. Proceed to the Loveland monument. 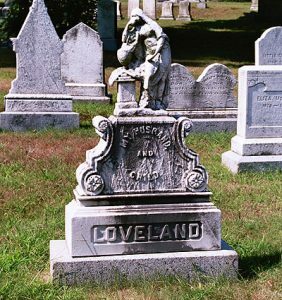 This is the lovely Loveland monument “to my husband and child,” a small version of Grief and her urn. The next stop is the Oliver Ditson monument. 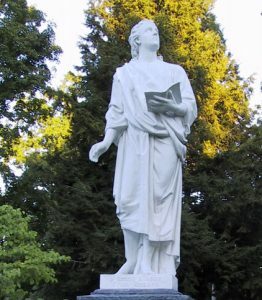 This statue of St. John the Evangelist — actually a reproduction of the original, which is in the Forest Hills Columbarium — was done by one of Boston’s most celebrated sculptors, Thomas Ball. You may know of Ball’s most famous work in Boston, the equestrian statue of George Washington at the entrance to the Public Gardens. Ball was also involved with the world of music; as a young artist, he made part of his living as a professional singer in church choirs and operas. He married Ellen Louisa Wilde, the daughter of a singing colleague and a relative of the Chickering family of Boston piano manufacturers, at the time the leading piano maker in the country. Even though the sculpture was meant for a Boston parlor, its original owner filed for bankruptcy and the statue was purchased by Oliver Ditson, who placed it instead on his own gravesite. In nineteenth century America, the name Ditson was synonymous with music and entertainment, especially at home. Oliver Ditson was America’s most successful and prolific publisher of sheet music. Ditson started out poor, but by 1856 he owned Oliver Ditson & Company (along with his partner John G. Haynes, buried next door), which bought other publishers’ catalogues and published a wider variety of sheet music, journals and books that had ever been available. At its height the company’s catalogue numbered over 80,000 different pieces of sheet music and over 2,300 music books; twenty printing presses were kept running around the clock. Some songs addressed sad contemporary subjects, like the one entitled “Under the Willow She’s Sleeping” (1863), about a mother who buried her child, which, as we have seen, was an all too common occurrence. One of the major reasons for Ditson’s phenomenal success was the development of the parlor organ, a relatively inexpensive musical instrument that found its way into many middle class homes. Parlor or reed organs, even fancy ones, cost less than half the average price for a decent piano. The parlor organ had to be pumped vigorously with one’s feet, but like more elaborate organs, could be adjusted for different types of sound effects—echoes, French Horn, trumpet, and so on. Parlor organs were also designed with multiple shelves to hold ceramic figurines, vases, and other decorative objects, in addition to the sconce shelves that held candlesticks or other portable lighting devices. Popular images like those produced by Currier and Ives often showed the family and friends gathered around the parlor organ, singing merrily. In the days before records and television, family sing-alongs were one of the most popular forms of entertainment. The Ditson Company survived until the 1930s when it was bought out by Philadelphia’s Theodore Presser. Before leaving, turn around and admire the beautiful decorative ironwork. Iron fencing such as the lovely fence and gate that surrounds the lot of William Pope was once a common feature at Forest Hills (and other Victorian cemeteries). It is the same fencing that was used for homes and parks. Cast-iron furniture and fences were sold by iron manufacturers such as Chase Bros. & Company of Boston for use in cemeteries, gardens and homes. Fences and gates came in many different types of designs and sizes; some, like this fancy weeping willow pattern, were especially appropriate for the family cemetery lot. Although black was more common, especially in cemeteries, occasionally iron fencing was painted white. Often, within the enclosure, iron furniture — chairs and garden benches — was placed as it would have been in one’s garden, so that visitors would have a place to rest and relax during their walk through the cemetery. Such furnishings were mostly banished from Forest Hills in the early twentieth century, since by then they were considered ugly and out of fashion. Cemetery superintendents all over the country came to regard the Victorian iron fencing as a nuisance; it needed yearly maintenance and was difficult to maneuver around with the new handy appliance known as the lawn mower. As a result, much of the beautiful fencing was removed (though, contrary to some urban myths, it was never used for “war efforts” — the chemical qualities of cast iron were such that it could not be recycled for this purpose), giving us the plainer — but easier to maintain — lots you see at Forest Hills and elsewhere today. There is one other surviving original iron fence at Forest Hills. Proceed to the Mary Southwick monument. This cross encrusted with flowers is a particularly lovely example of a combination of two popular themes, the cross and flowers. Like Lucy Bixby, Mary’s husband wanted people to know his wife was a good Christian woman. At 26 years of age, Mary Southwick was a relatively young wife when she died. In the nineteenth century, flowers were a part of popular culture. Books with titles such as The Language of Flowers were extremely popular, and exchanged as gifts. These books assigned symbolic associations and special meanings to all different kinds of flowers and plants. Although there was never one fixed set of meanings, in general these books tended to agree on flowers and sentiments that were associated with death, grief and mourning. Proceed next to the William Tompkins monument. While still on Lake Avenue, stop for a moment to admire the monument of William C. Tompkins (also marked “West.”) This is a spectacular example of the stonecutter’s art. It seems that whoever chose this monument asked the stonecutter to include as many designs as possible, and the carver was happy to oblige! There is a tree trunk (“a life cut short”); a cross (indicating faith and piety); an anchor and rope (associated with the allegorical figure of Hope, but could also signify that Tompkins was a mariner or somehow involved in shipping); oak leaves (indicating strength and steadfastness); and a scroll (possibly referring to Biblical verse, but more probably included with the intention of adding more names some day). The next stop is the Clapp monument. Framed by the large hedges that surround her, this lush figure represents a transitional style between Beaux Arts classical and allegorical imagery and the curvilinear forms of Art Nouveau, as exemplified by the work of Alphonse Mucha in the art world during the late nineteenth and early twentieth centuries. 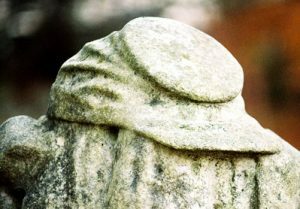 In some ways similar to the Randidge monument, this woman is dressed in robes, and has a classical profile and upswept hair. Unlike the dark and sorrowful Randidge figure of Grief, however, the Clapp figure is an expression of movement and light. This figure holds a plaque declaring “Life More Abundant” while her robes seem to swirl around her in response to a light breeze, cascading over the base on which she sits. One sleeve has dropped off her shoulders as her hand clasps a bouquet of flowers in full bloom. In contrast to her lively robes, the face is serene and meditative as she contemplates the plaque. Next to the Clapp Monument a little Scottie dog curls up at his master’s (or mistress’s) grave — probably that of a small child or infant. Another lady in swirling robes is next — the Bangs-Nye monument. The Bangs Family Monument is unusual in its conception and form. The female figure, an allegorical representation of Hope, clutches a chain linked to an anchor. At her feet lies a Bible. Her body thrusts forward as her robes are buffeted by wind. Scholars have posited the sculpture was carved in Italy based on a wooden model of a ship figurehead, possibly by prominent Boston wood carver Alfred Nye, who is connected to the Bangs family by marriage. More research needs to be done to determine more definitely this theory (there are few documents that can help), but knowing that so much carving talent was in Italy rather than in America at the time makes this theory more than just plausible. The next stop is the Samuel G. Reed Monument. Here we encounter again the figure of Hope, who we met earlier in the walk at the lot of Nathaniel Tucker. This Hope also has an anchor, but has one arm held aloft, and wears a headband with a star at her forehead. The star motif is repeated in the brownstone curbing and post that surround the lot. The lower part of the monument is an image of a clipper ship. Why the clipper ship? Reed is listed in Boston city directories during the 1840s, 1850s and 1860s as a wine merchant. He and his partner Reuben Wade owned and operated Reed, Wade & Co. during these decades on North Market Street in Boston. A good guess would be that the clipper ship represented the expeditious fashion in which Reed, Wade & Co. imported their wines from foreign or exotic ports. And that is part of the story, but not all. In nineteenth century America Samuel G. Reed was also known for owning the largest fleet of clipper ships in the country. Clippers were known as the “greyhounds of the sea.” These sleek ships represented the most sophisticated, rapid form of sea transportation available. Reed, Wade & Company at their height owned about 20 clipper ships, many of these built and launched during the 1850s. Every time the firm launched a new ship, lengthy descriptions of the newest, beautiful Reed clipper appeared in local papers. The company commissioned the building of some ships and purchased others; although not much information seems to survive about Reed as a wine merchant, he and Reuben Wade were clearly successful in a “stellar” way. The clippers brought goods from all over the world; Reed and Wade undoubtedly had one of the best-stocked shops in the city of Boston! The recurring star motif at the Reed lot is significant. The star on Hope’s forehead can refer to Heaven, to celestial bodies, and even to sea navigation. The star motif had an even closer personal connection to Reed, though. At least four of his clippers carried the word “star” in their names: the Shooting Star (1851), the Star of the Union (1852), the Silver Star (1856), and the Shooting Star II (1859), the last clipper ship known to have been built for the firm. Stars were for Reed an important (and maybe a lucky) symbol of his successful and prosperous life, so it is not surprising that they surround him in death. Proceed to the last stop on the tour, our famed Milmore Monument. 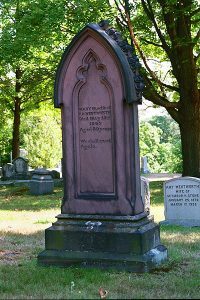 The Milmore Memorial celebrates the lives of sculptor Martin Milmore (1844-1883) and his brother Joseph (1841-1886), a talented stonecutter who taught the art of carving to Martin. Martin and his family were Irish immigrants who settled in Boston in 1851. As a youth, Martin Milmore revealed himself as unusually artistically talented, and apprenticed himself to sculptor Thomas Ball. Martin’s first great success came in 1867 when he was chosen to create the Roxbury Soldier’s Monument at Forest Hills Cemetery. That piece was followed by his Soldiers’ and Sailors’ Monument, erected on Boston Common in 1877. These two memorials were widely imitated. Martin Milmore died tragically young, at the height of his career, at the age of 39 from cirrhosis of the liver. His brother Joseph died just a few years later. 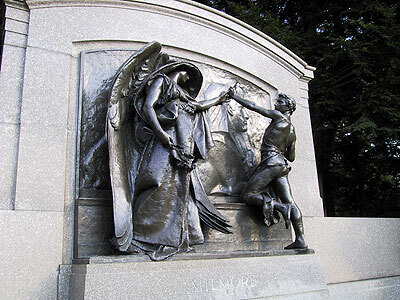 Following Martin and Joseph’s deaths, the Milmore family chose Concord’s Daniel Chester French to execute a memorial. Daniel Chester French was a perfect choice: he had been a friend of Martin’s, and had also trained with Thomas Ball. He became famous in his own right as the creator of the Lincoln Memorial in Washington, as well as numerous other works including Concord’s famous Minuteman. The Milmore Memorial, also known as Death Staying the Hand of the Sculptor, is one of his greatest works. The beautiful allegorical figure of the Angel of Death gently lays her hand on Martin’s (or Joseph’s) hand, as a reminder that she has come to usher him away. In her other hand Death carries a bouquet of poppies, which holds the promise of (eternal) sleep. The sculptor, wearing his work apron and holding his tools, is surprised and seems unwilling to be interrupted. As we know, Martin and Joseph did go. But the sculpture they are shown working on was actually completed years before their deaths. The massive (in real life) granite Sphinx carved by Martin and Joseph Milmore as a Civil War memorial sits at Mount Auburn Cemetery, where it was installed in 1872. 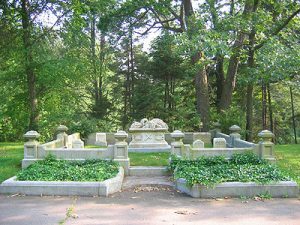 So in this unique and beautiful memorial at Forest Hills Cemetery, we also see a connection to the Boston area’s other great Victorian cemetery. We hope you have enjoyed your tour. Please come back and visit us again! .